[Kuriyama] is a leading company of food and industrial grade suction hoses. Kuriyama's suction hose is very famous for strong vacuuming, abrasion resistance, heavy duty applications, and high quality. Most of our products comply with many international standards; such as FDA, USDA, RoHS and etc. We have huge range of products, so our products are used in various types of applications. [PIRANHA] is one of the most popular high pressure hose brand worldwide. Especially, the quality made high pressure hose products for sewer cleaning and paint spraying are used all over the world. [ACCUFLEX] is a beverage hose brand that has been granted approvals by the world leading beverage manufactures. Kuriyama has recently developed a new product, LPG hose that is reliable and high quality, and launched it onto the market. 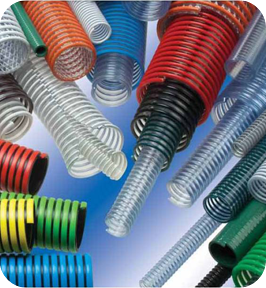 [KURI TEC] is a thermoplastic high quality hose brand with a variety of uses including NSF approved products. It is used for air, oxygen, drinking water delivery and transfer.